Talking to Johnny Gee at antique motorcycles, it’s inevitable that some of his unbridled passion for motorbikes will rub off on you. It seems that no matter what kind of bike it is, Johnny is going to want to tell you all about it. Today the topic of conversation centred on the Suzuki GT 750, aka the “Water Bottle”. The bike’s endearing, and somewhat odd, nickname was born from the fact that it was the first water-cooled Japanese motorcycle to see serial manufacturing. In order to compete with the more powerful bikes being produced by companies like Honda and Kawasaki, Suzuki modelled the GT 750 on their already popular T500. This time adding an extra cylinder and water cooling, so the bike could be ridden harder and longer without overheating. The Water Bottle was a three-cylinder, two-stroke 750cc machine, and was in production from 1971-1977. 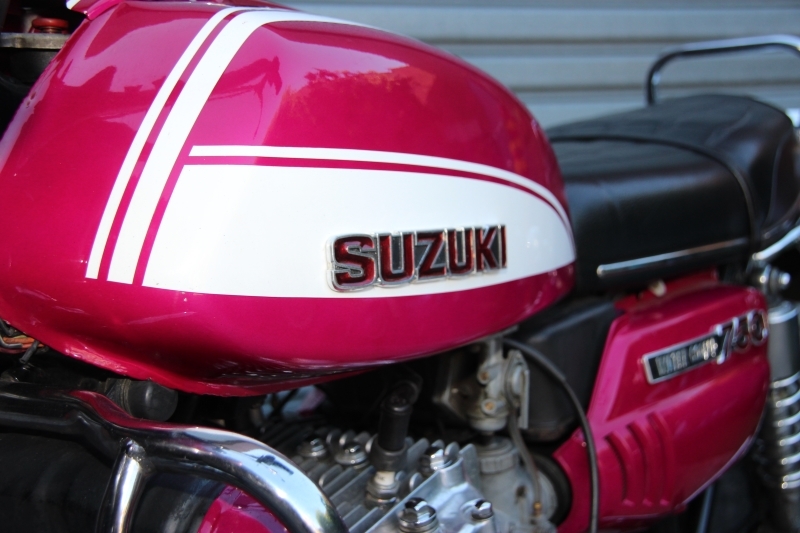 First shown at the 17th Tokyo Motor show in October 1970 and launched in Japan in 1971, it was a uniquely constructed engine at the time, and is considered by many to be one of the all-time classic Suzuki motorcycles. They were known affectionately by many names around the world, including the “Kettle” in Britain, the “Water Buffalo” in the US while the “Water Bottle” was a moniker unique to Australia. The first version, named the J model, was rolled out of the factory in 1972 and was available in blue or magenta. They had an oil injection system so fuel did not need to be pre-mixed, and in 1973 they moved to a disc brake on the front wheel. Suzuki continued to refine the bike, making minor changes from 1972 until 1977 when production ceased. Although it was originally launched as a sports bike (GT stands for Grand Tourismo), the Water Bottle is instead known by most as a great touring bike. It’s quite a heavy machine, weighing in at just under 250kg, but the GT 750 is incredibly smooth, quiet and comfortable to ride. Nowadays most examples sell from about $9000-$25000. Equipped with a five speed gear box and a three-into-four exhaust, they are a bike with no inherent problems but they do need to be regularly used. The two examples pictured here are a 1972 model in magenta, and a 1976 A model. 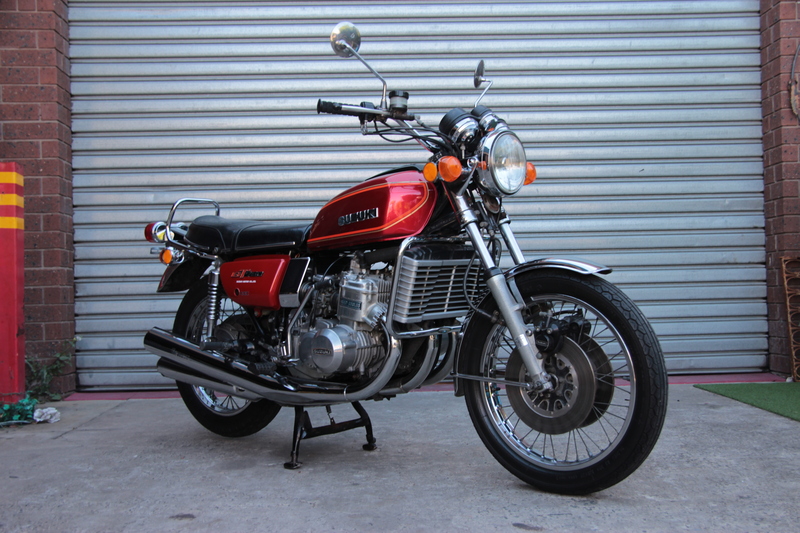 The ’72 model is a completely unrestored bike and quite rare because of this fact. Most have had some adjustments or restorations made over the years. The A model was the second-last model to be made. 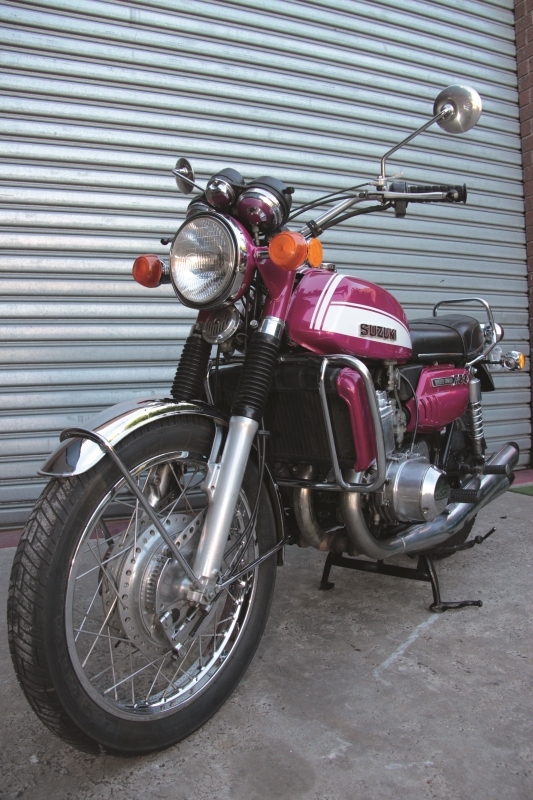 It only has 32,000km on the clock and is a one owner bike that was sold new in Melbourne by Malvern Motorcycles.